ArcGIS GeoEvent Processor integrates real-time sensors and provides instant notifications when events are triggered. Imagine applying real-time data to ArcGIS maps and applications connecting to a wide variety of data streams and services, performing continuous processing and analysis, and notifying key people when conditions or events occur that require immediate attention. 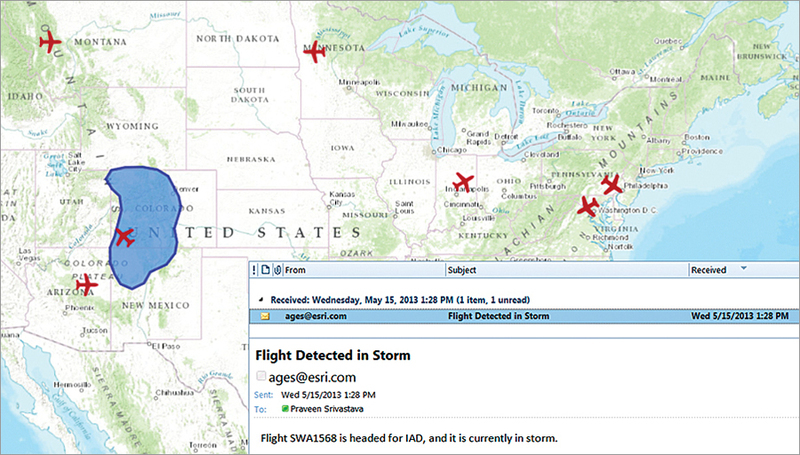 With ArcGIS GeoEvent Processor for Server, this is possible. ArcGIS GeoEvent Processor is a new optional extension for ArcGIS for Server Standard and Advanced. It brings real-time data monitoring to ArcGIS by connecting with any type of streaming data and automatically alerting personnel when specified conditions occur. They can respond faster with increased awareness whenever and wherever change happens. GeoEvent Processor connects to common sensors and data feeds, including in-vehicle GPS devices, mobile devices, and social media providers. It also includes an exceptional set of real-time filters, processors, and analytical capabilities that can enhance the streaming data to ensure the most important information is returned. Monitor the temperature of goods in delivery trucks, notify customers when their deliveries are 15 minutes away, and track the status of field crews to optimize their performance in the face of ever-changing field conditions. GeoEvent Processor seamlessly integrates real-time streaming data with the modern enterprise IT architecture. For more information, visit esri.com/geoevent. Adam Mollenkopf demonstrates the new capabilities of ArcGIS for Server.